As communicators, whether new to the industry or seasoned professionals, we are always looking for sources of inspiration. 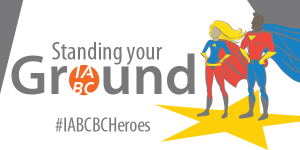 Through personal stories of triumphs, achievements, a-ha moments and career highlights, IABC/BC’s annual signature event does exactly that—inspires us. Last year our theme was “How I Made My Mark: Career Stories on Building Reputation.” It was a motivating, entertaining and often moving evening. Eight speakers told us about the moment they felt they “arrived” — when they went from uncertain to confident; from the shadows to the forefront. What was the turning point or challenge that required them to rise above, speak out, take control or swim upstream? On April 20th at the CBC Studios we will celebrate the successes of IABC/BC “heroes”. Communicators who have stood their ground at some point in their career. As Spiderman’s Uncle Ben said, “With great power comes great responsibility.” We all have significant responsibilities as communicators. In a post truth world of fake news and alternative facts, this has never been more important. Whether it’s finding the courage to tell our managers and CEO’s what they do not want to hear, or being the honest broker between the media and our organization, we are the truth tellers and it tests us all at some point in our careers. Join us for this special evening as we share the stories of those who have stood their ground, and have become better communicators because of it.